The Insurance Board of Sri Lanka (IBSL) & Insurance Association of Sri Lanka (IASL) have teamed up together with all the life insurance partners in Sri Lanka to launch the national life insurance month from September 1st-September 30th. This initiative has brought all the life insurance firms as we all strive for one goal- to ensure that all Sri Lankan’s are insured. 2.What’s the main focus of Life Insurance Month in Sri Lanka? At HNB Assurance, we are well known for our famous ‘spirit of caring’, and have joined forces to help safeguard the future for you and your loved ones, hence the reasoning behind our campaign which urges you, the uninsured to get life and live life. The players in the insurance industry are striving to meet 1,000,000 individuals and spread the message about the importance of insurance for all Sri Lankans. This is the official ‘Flame of Protection’ which is intended to extend the protection of life insurance to Sri Lankans and will be the prominent logo used during the month of September. The initiative looks to tackle a glaring issue; According to Daily ft less than 13% of Sri Lankan’s are covered by life insurance, so this combined effort will be used by the 15 life insurance companies to bring life insurance into 15 new regions around Sri Lanka. 4. What Should I expect during National Life Insurance Month in September? If you don’t have insurance already, expect our friendly insurance advisors to speak to you. We will be issuing leaflets spreading the ‘Get Life, Live Life’ message. We have also planned a bunch of regional street promotions all around Sri Lanka, so do let us know if you come across any! The team has invested significant amounts for TV, Radio and Print advertisements so be on the lookout for those. Visit the official website to catch the latest news and find out when insurance agents will be coming to your town. LIKE their Facebook page for exciting competitions and be aware of the latest information! 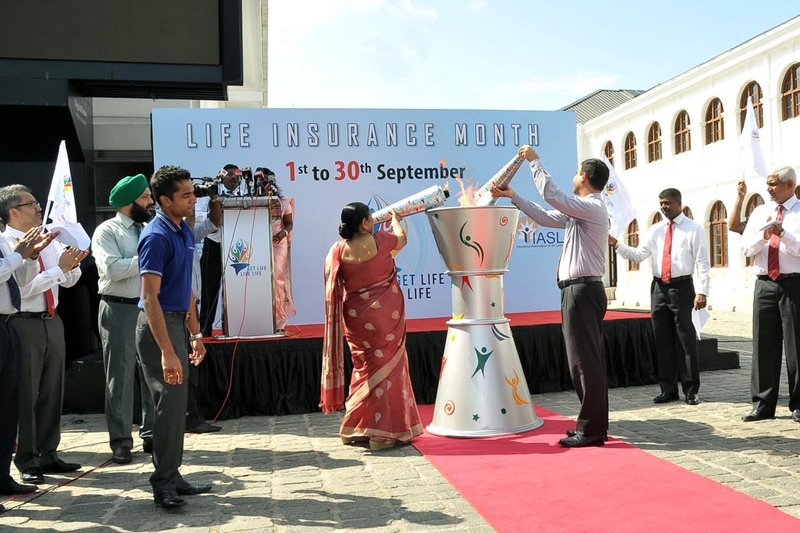 The National Life Insurance month was officially kicked off at the Arcade Independence Square on Tuesday, September 1st by senior individuals of the Insurance Board of Sri Lanka (IBSL) and Insurance Association of Sri Lanka (IASL) with the lighting of the official torch. We hope that the coming month inspires YOU to look into secure your future with life insurance!